marital bless: Well, we're off again. Main reason I'm not looking forward to this weekend, the potential of one of these. We're staying at a college campus! Are you kidding me?! Plus, there's not even a lake. Blech, it's just like poor planning all the way around. I hope this weekend turns out better than you're expecting. I went to DH's family reunion recently and surprisingly had a blast! Found your blog through the Nest and have been reading for a couple months now:) And you’re staying at a college campus that has no lake? Ah...it just dawned on me what college campus that probably is. Haven't spent a lot of time out at that one...I went to the BIG college...on the lake. I think it's very pretty out there though. If you have a few minutes, and can get away I have a few places you must visit - Slims or the Corner Bar - it's a toss up to which one has the best burgers (both have good refreshing drinks), Dave’s or Keith’s Pizza - hands down the best pizza I have had since moving back from NYC and Emily's Country Cottage - if you like crafty stuff (handmade crafts, quilting, etc.) - you can spend hours looking at stuff here! You are a life saver! I will definitely be writing these down as my to-do's! Thank you! Depending on the type of mood you're in with your hubby, the twin bed situation could be a good thing... if you know what I mean. :) Have a good time! Oh no. 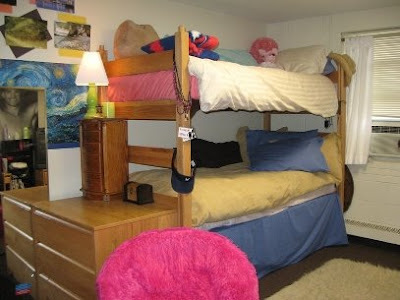 Dorm bunks. Try not to hit your head on the ceiling when you wake up. Ouch. 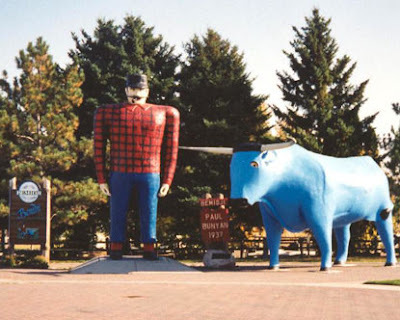 I hope you have fun with the family, Paul, and Babe the Blue Ox. This was a fun read! Dorm bunks are the worst, try not to hit your head. Hope your family reunion is a blast!